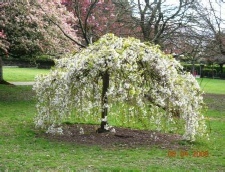 Historic Devonport park is a treasure. 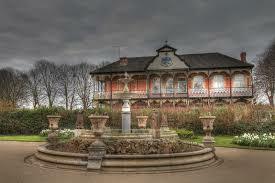 It is Victorian and grade II listed. 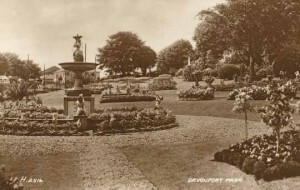 Established in the late 1850s it was the first park dedicated for public recreational use in any of the three towns (Devonport, Plymouth, Stone house). The parkland at that stage arced fully around Devonport, hence the term often used – “Devonport’s Green Arc”. Originally under military control, the land, immediately outside the town’s garrison walls, was used for training army personnel. The Army continued to use the land for many decades even after it was designated public parkland – initially to continue their practice drills, but eventually for recreational use. Blending in with the community, Devonport’s military bands provided music regularly from the bandstand – afternoon music in the park was very popular. 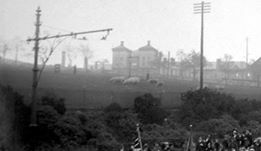 It can be seen from this photo that sheep grazed freely upon Devonport Park right up until the first world war. The architect responsible for designing the lodge and other park structures was Alfred Norman of Plymouth, with Messrs Arnold & Son and George Perkins being responsible for the construction work. The Doris Gun, is probably the most well-known of the park’s features. 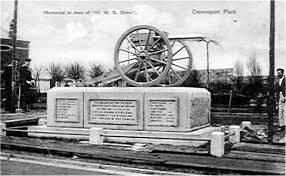 The gun was captured from the Boer war and brought home to Devonport aboard HMS Doris. The ship’s crew subscribed to have the gun set as a monument in honour of their colleagues killed in the war – it was installed in its present site amidst a local ceremony in 1904. In 2007 the gun was professionally restored and now looks very attractive. 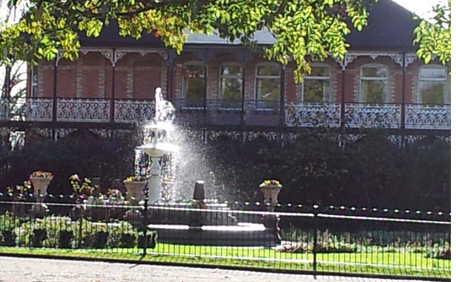 The Napier Fountain, is visible from Fore Street, being located just a few yards from the lower lodge; It is commonly called the Napier Fountain or the Napier Memorial. It was erected in honour of Admiral Sir Charles Napier (1786-1860) and paid for by royal marines and sailors who respected the work he carried out on their behalf; they each gave up one day’s pay. During the 20th century the structure fell into disrepair and several of the artefacts/statuettes disappeared. 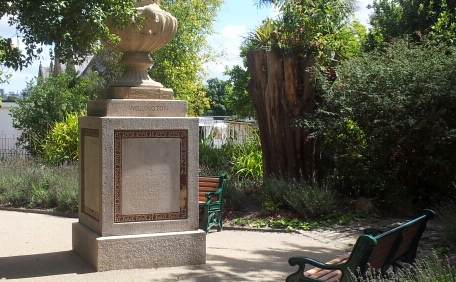 The basin was removed by museum staff around 2005/2006, for protection. The whole structure was finally restored in 2011. The Sicilian Fountain is located near the front of the Higher Lodge, within the Rose Garden. The Great War Memorial The memorial to the brave residents of Devonport who lost their lives in WWI, commonly called the Great War, was erected in the park on 14 March 1923; it is located near the Exmouth Road entrance. This memorial was unveiled by Field Marshall Lord Methuen GCB, SCMG, GCVO, and is sometimes referenced locally as ‘The Methuen Memorial’. Many local dignitaries were present at the ceremony such as businessmen, Police, Armed Forces personnel, the British Legion, Nurses, the Mayor of Plymouth and Lord St Levan. It was Lord St Levan, chairman of the memorial committee, who gave an address … “it would serve to point the path of duty to those who come afterwards should they receive a similar call”. 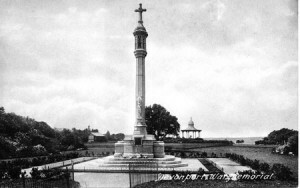 The memorial is a 33 ft high granite column designed by Mr C Cheverton and built by Mr J B Hunt of Plymouth. The column has a lantern and cross upon the top. Lower down there is a marble statue of Victory. On the plinth is a bronze plaque with relief lettering and the Devonport Coat of Arms. A second bronze plaque, on the opposite side, has the emblems of the Royal Navy, the Army and the Royal Flying Corps. 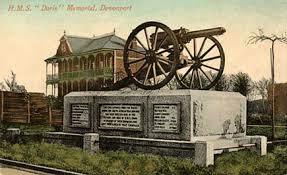 The inscription on the memorial reads … “To the immortal memory of the citizens of Devonport who fell in the Great War”. On 9 November 1998 the memorial became a Grade II listed structure. In keeping with the rest of Devonport park’s restoration project in the millennium decade, the figure of Victory was restored, in 2007. A 1920s postcard of the memorial published by Abrahams of Devonport. The Higher Lodge, is a substantial two-storey refreshment pavilion (today, converted for use as an residential home) with elaborate cast-iron verandahs and balconies, and a central ornamental gable and weathervane. The refreshment pavilion and rose garden formed part of Meyer’s alterations to the park ( 1895, 1914). Until the 1890s this formal area of the Park was still a part of the ‘Dock Lines’- occupied by the Granby Bastion. 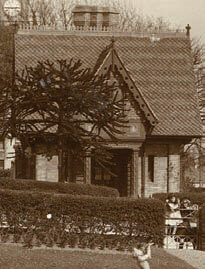 The Rose Garden, the Sicilian Fountain and the distinctive Higher Lodge, (originally a Park pavilion building) are among the improvements made after 1894. 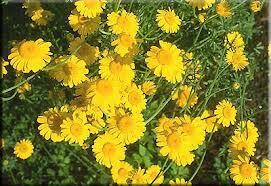 Civic pride was represented by the prominent display of the Devonport coat-of-arms – still on show today. The Lower Lodge, is located at the Fore Street entrance to the park; it is a grade II listed building. This building, dated 1858, was designed by Alfred Norman of Devonport in the style of a Swiss lodge. The Gas Cleansing Centre is located at the north-east corner of the park, near Exmouth Road. A Cleansing and Decontamination Station was built in 1941 during WWII, in case of gas attacks, the building was probably never used for that purpose. It languished unused for several years, but for the last decade had been used by the Plymouth Model Railway Club and is now currently used by a national company that run Stiltskin’s Soapbox Children’s Theatre. 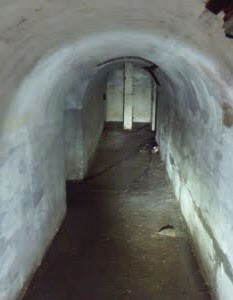 Air Raid Shelters, Devonport Park has 5 known shelters providing refuge for up to 1,200 from WWII. 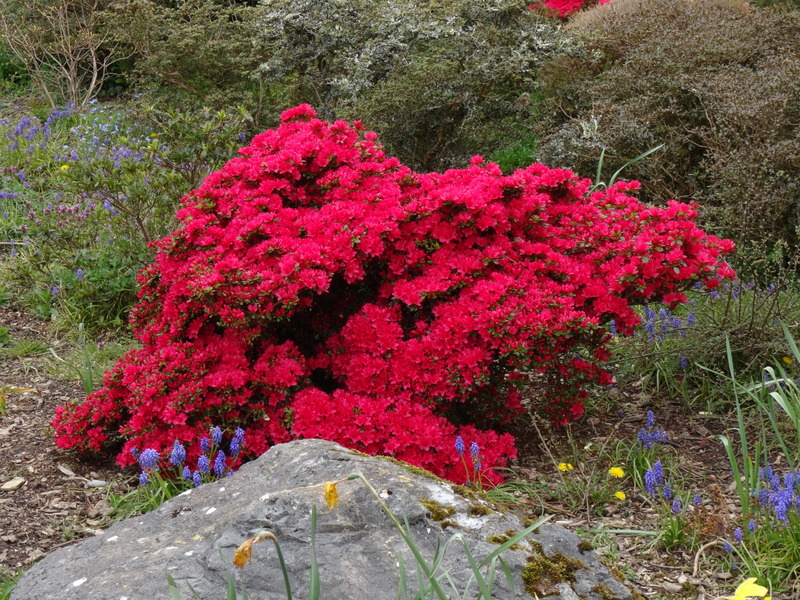 The Galatea Obilisk is visible from Fore Street, being 50 metres west of the Lower Lodge, but you may need to peer as sometimes it becomes hidden by bushes. The Chatham Vase is said to represent famous Britons who opposed the Spanish; it is located within a small fenced garden, just ten metres north of the Lower Lodge. £3.294 million of funding was awarded to Plymouth City Council by the Heritage BIG Lottery Fund, although the total cost of the restoration exceeded £5 million. This was a joint bid involving Plymouth City Council and Devonport Regeneration Community Partnership. 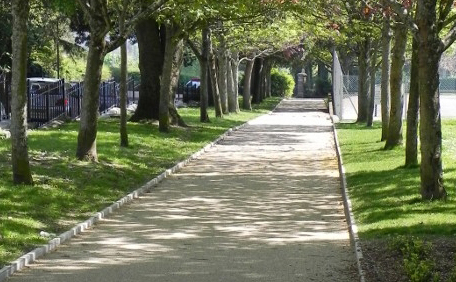 The funding was used to transform the park and restore it to its former beauty. 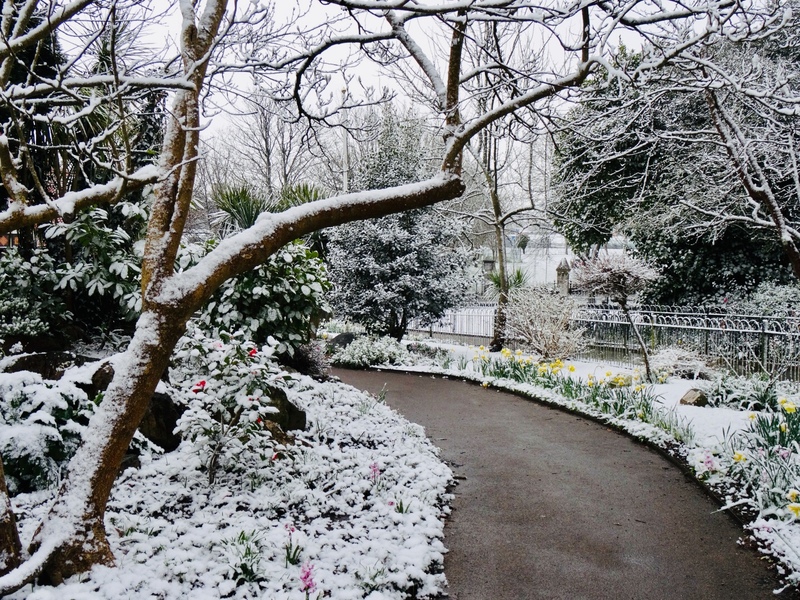 Much work has been carried out throughout the years, such as the restoration of the lower lodge, a modern new play area and a purpose-built Cafe which includes sport changing facilities and a community room. The bandstand, although was not part of the original lottery bid but, the public, as shown in several consultations run by the by the friends, supported the idea and so the Friends bid for £50,000 of funding to enable work to start. 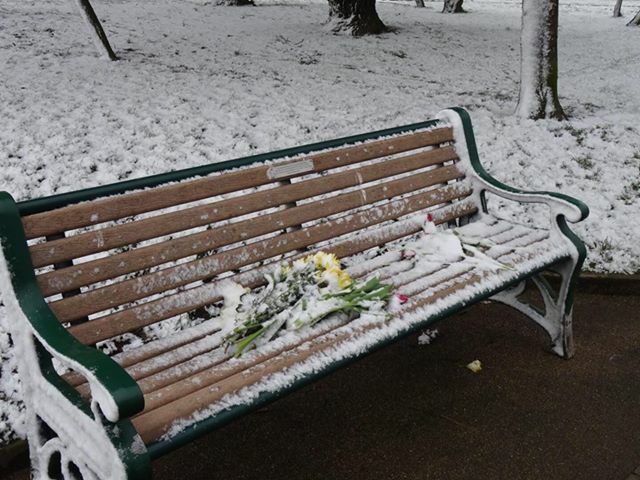 After successfully demonstrating the public’s support for a bandstand, the HLF agreed that the contingency fund from the original bid could be used to complete the work. The Victorian design chosen, is quite a close match for the original structure, dismantled in the 1950’s.